Not sure if anyone has been following this, its pretty sad, but he seems to be getting better. Top Gear's James May says he is convinced his fellow presenter Richard Hammond is "perfectly intact" after a conversation at his hospital bedside. 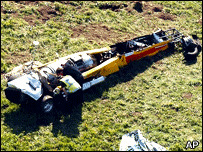 Mr Hammond suffered a "significant brain injury" when he crashed a jet-powered car at a speed of up to 300mph during filming near York. Mr May said it was not a long talk "but it was a conversation". "I'm not a doctor but I am his mate and I believe that deep inside the Hammond I know is perfectly intact," he said. The accident is being investigated by the BBC, the police and the Health and Safety Executive. Mr Hammond, 36, was earlier moved out of intensive care at Leeds General Infirmary, where he has been since Wednesday, and doctors said he is making "satisfactory progress"
Doctors also downgraded his condition from "serious but stable" to "stable". The doctors treating him have previously said they are "reasonably optimistic" he will make a good recovery. Mr Hammond's wife, Mindy, and Top Gear's other host, Jeremy Clarkson, have also been at his bedside. Mr Clarkson told the Sun newspaper that he had insulted Mr Hammond's driving skills - prompting a smile from Mr Hammond. He also said Mr Hammond had no visible injuries following the ordeal he had been through other than a black eye. The presenter had been driving a jet-powered dragster similar to the Vampire - used by Colin Fallows to set the British land speed record of 300.3mph. Mr Hammond had to be cut free from the car after eyewitnesses at the Elvington airfield near York described how he "veered off to the right" and the car's parachutes opened. Primetime Land Speed Engineering, which is jointly run by Mr Fallows, organised the event. A spokesman for the firm said the vehicle Mr Hammond was driving "had been prepared and was being operated to the highest of standards". The BBC said in a statement that it had started an investigation into the accident and promised full co-operation with the HSE. "We continue to be concerned about [Mr Hammond's] condition and we are keeping in touch with his family," the statement said. Top Gear has courted controversy in the past over its big-budget car stunts, and in 1999 a group of MPs criticised the series for being "obsessed with acceleration and speed". Been all over the news the last 2 days, I wish him a speedy recovery, Top Gear wouldn't be the same without him. My wife’s a great fan of his, strange though that I haven’t seen any comment from Jeremy Clarkson who hosts the BBC show he worked for, maybe I’ve just missed it or the press have not reported it, at least the ones I read. I wish him well and a quick and full recovery. Wow, I didnt know about this until now. Even though we dont get the show over here in the states, I still enjoying watching it when I can. I hope he makes a full recovery! This will make a badass story when he is old "I crashed doing 300+mph"
Better than saying I crashed my milkfloat! I did hear that on Radio 1's news, he also apparently opening his eyes, sat up and asked what happened! Should hopefully be moved to a general ward soon. Good news! Love the show, pity bout this. We get it I think it is on BBC america. It looks like the hampster is back on the wheel again,and will be treading the footwells again in the near future,here is to you richard,drive on,live on .